This past Christmas we took our first ever family cruise. It was my second cruise. The first cruise I did was over seven years ago on the Queen Mary when I was four months pregnant with my daughter Sophia. It was a business trip for my husband and my parents watched my son Max during our vacation. I recall the trip being relaxing, enjoyable and fun. We sailed from New York City to the gorgeous southern town of Charleston, South Carolina and then to the Bahamas for a day. Fast forward eight years, and we were on our first family cruise with the kids and my sister and her family. Four adults, four children ages 5-9 and four days and five nights on the Royal Caribbean meant we were in for quite an adventure jam-packed with fun, excitement and a small number of entertaining mishaps. Looking back, it was a fabulous trip and we had an absolutely wonderful time glimmering with special memories. 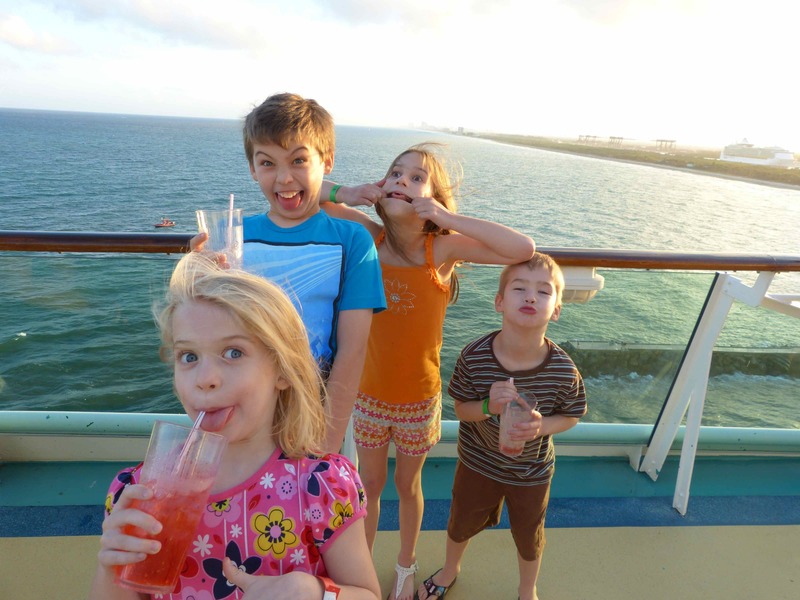 Yet it wasn’t without a small amount of “newbie cruiser” mishaps which prompted me to write this list of tips for surviving and enjoying your first family cruise together. 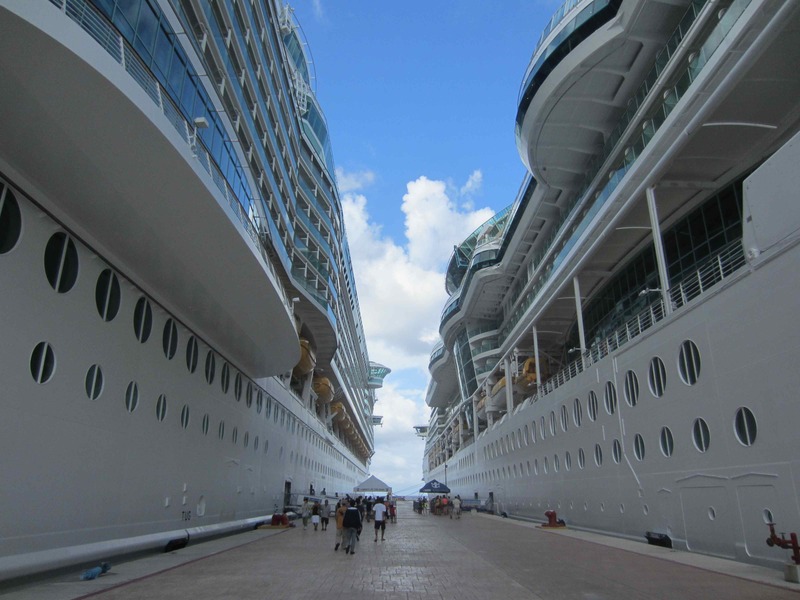 Two Royal Caribbean Cruise ships at the port in Cozumel. Our trip was in total 14 days long with three days in Disneyland, four days on the cruise and the rest of the time in Key Largo, Florida. Since we did not have access to a laundromat, we decided to pack enough clothing for two weeks. For the entire trip including the cruise, we significantly over-packed and ended up wearing our swimsuits most of the time. We probably could have reduced our suitcase by 2/3 of the clothing inside. Another thing to consider is that most cruises have a “dress code” for dinner in the formal dining room. Before leaving, make sure you check. On our cruise, one night was called formal, the next night semi-formal and the rest were called “Smart casual”. We reviewed the guidelines which stated formal meant a tuxedo or suit for men and a cocktail dress for women! Of course we didn’t bring any of that kind of dressy clothing along yet since the cruise was geared towards children it was more relaxed on dress code. For the children, we made sure we had long pants for the boys and sundresses for the girls. Another must-pack item is both adult and children’s Dramamine. I had to take it every single night to prevent seasickness. The ship’s store has limited amounts of medicine thus I would highly recommend packing everything you need just in case. Finally, if you are bringing young children packing snacks from home is a must. Of course the cruise offers an abundant supply of never-ending food but it doesn’t have the typical children’s snacks like pretzels, goldfish, etc. On days at port, this ending up being a huge problem (see below on “excursions” for more details). If desperate the ship usually has a small, overpriced general store. We also found out the hard way that you can’t bring fruit off the ship into other countries. There goes that healthy snack! Boarding a ship of over 3,500 passengers is a very big ordeal. Expect a huge line and a little bit of chaos. We were provided a window from 12-3 pm to board. We arrived around 12:45 PM and the line was already huge. Perhaps arriving a little before noon would have helped but the biggest mistake we made was not packing our essential cruise/relaxation items in our carry on (such as our swimsuits, sunscreen, hat and other key items we would need to hang out and enjoy the pool before we left port). The experienced cruisers were ready to go and got to enjoy the pool while we waited hours to receive our suitcases in our room. Eat lunch beforehand. We had just came from three days in Disneyland meaning loads of not so great food and were all ecstatic to eat our first meal on the cruise. I envisioned a relaxing delightful lunch yet was quite wrong. Thankfully we fed the kids beforehand as by the time we got on board and entered the dining room it was almost 2:30 pm and it was mobbed. It appeared that everyone else had the exact same idea. The smart idea would have been to eat beforehand, pack or wear our suits and hit the relatively deserted pools for an afternoon of sun and fun. Don’t buy the alcohol plans unless you are truly there to party! We didn’t do our homework in advance as we were relatively rushed having an early Christmas, packing and leaving in mid-December for our vacation. Once aboard, we were greeted by an energetic woman selling the drink packages and decided to go with the outrageous drink packages: $20 unlimited bottled and bubbly water/day and $55/day unlimited wine, beer and spirits. This was per person and after the first night I realized that a nice glass of wine cost $9 and there was no way I was going to drink $55 worth of wine a night. Thankfully the next day we were able to cancel the drinks plan. Buying a bottle of wine at dinner was also very reasonable and prices were what you’d expect to pay at a medium-scale restaurant. 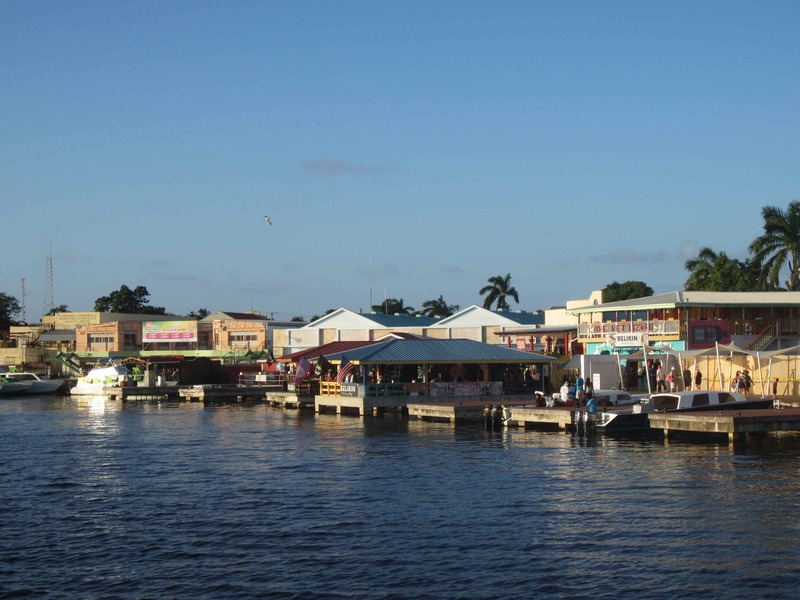 The tiny, undeveloped port of Belize City did not offer much to see or do. Before going on your cruise carefully read the descriptions of the tours and note the time allotted in each place/destination. Make sure to book your excursions at least a couple of weeks in advance to ensure there is still space. Otherwise you may be disappointed. Make sure it is an excursion that everyone in the family can do. For example, the snorkeling excursions are most fun if all your children know how to swim. Otherwise they end up sitting on the bench unhappy. Make sure you pack lots of snacks as for both tours we did not have lunch served and there was no food available which was not easy for hungry children. We did not get back onto the ship after our morning tours until 2:30 PM meaning we were all starving for lunch. If you don’t like the choices, research and go off on your own. In Cozumel, we did a lovely four-hour tour on a catamaran that took us snorkeling and then to a fabulous, kid-friendly beach. The only issue was that our time doing each event was minimal. My sister and her family passed on the tour and instead took a taxi directly from the port to a nearby beach similar to the one we went to our tour. Not only did they save money, they also had the freedom and flexibility to spend as much time at the beach as they wanted. With young children, they don’t last long checking out the port towns. Belize City was not worth it and we only spent an hour or so shopping in the port at Cozumel. I would much rather have spent more time at the beach than visiting the ports. If you are tendering be prepared for very long lines to disembark the ship! Visiting ports are much easier. Make sure you have enough downtime for the kids. Cruises can be awfully overstimulating and it helped to have some books, toys and DVDs to watch back at the room when the kids needed a break. If the cruise has a “kids club” or babysitting service, use it! Many of the evening shows start late and are not kid-friendly thus we were unable to participate. Our cruise had a free kids club with time slots from 9-noon, 1-3, and during and after dinner time. Not only did the kids have fun, we got to have some time to ourselves. Make sure to sign up ASAP to ensure there is enough space. Check luggage directly with airlines the night before you disembark. This was a wonderful service. Not only did it make the disembarking process much easier (you don’t have to haul around your huge suitcases down the narrow halls and into the tiny elevators when 3600 others are doing the same!) it meant not having to wait in line at the airport either to check your luggage. All you do is pack you bag, put on the tags and set it out in the hall of your room by 11 pm and voila, it is handled for you making the process beautifully smooth. Be ready to leave first thing in the morning. We arrived into port around 7 am a little earlier than planned. Instead of going up and having yet another huge breakfast, we should have immediately gotten off the ship. There was an announcement that the waiting time at 8 am was small. We didn’t leave until 9 am and the lines for the elevators and to disembark the ship were long by that point. Obviously this is not a complete list however these were some of the most important things we would change next time if we were to go on another cruise. Please feel free to leave comments below if you have any tips to add. Stay tuned…pictures from our day at tiny Rendezvous Caye in Belize is coming up next. Great tips, Nicole. We have never been on a cruise, so this information was interesting. Thanks! It was definitely a different experience. I’m glad I did it but am more of a land person as I was terribly sea sick most the time. But we had a great time! Fantastic to cruise with the children – we were invited on the Baltic cruise with our kids some years back and it was an amazing experience. 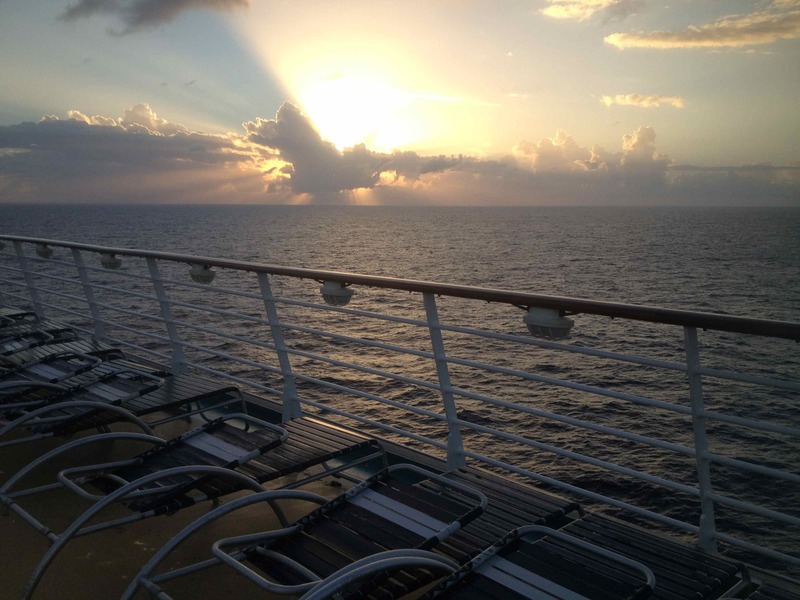 I was surprised because I never ever thought cruising was for me or the kids …. but it turned out to be incredible! Love the photos especially the “our crazy kids ‘ 🙂 Happy 2014! My parents took us on a number of cruises when we were kids, but that was like 35 years ago. Gosh, the 4 of us, 11 years separating the youngest from me, the oldest, totally loved it. Great tips. Thanks for the snacks tip. I went for a cruise when it was just my husband and I for our honeymoon and we had a blast. Now, I have a son. I have been considering maybe doing another cruise but I am not sure he is quite ready yet. He is only 7 months old. One more tip I would add is don’t bother paying for the expensive rooms because most times you won’t spend time in the room. You would most likely be outside having fun. Thanks for the comment! 🙂 Great tip ! Wow, nine cruises Kathryn! That is amazing! Where have you been? Wow, that is a lot of cruises! Sounds awesome! Yeah!!!! I will look forward to reading all about it on your blog! YOU WILL MY DEAR Talented friend! We’ve been on one short (2N) cruise with our two, but wondering about taking a longer version next time. They’re very good about catering for a wide range of people but the big thing that stood out to me was how many of those people want to do the same things all at the same time! So all those tips (like feeding the kids lunch beforehand) can go a long way in staying flexible and making the trip more relaxing. Reblogged this on Spotlight On Travel. I haven’t really figured out wordpress yet, I didn’t know how it worked and hit it. Do you want me to remove it? Your tips can really make a family cruise run smoother. I am planning to Sail New Yorkwith my family cruise. I needed to know these things.